Fair warning. This will probably only resemble any red beans and rice that you've had in the fact that it contains red beans and rice. I've never actually had real red beans and rice so I have no idea what it's supposed to taste like. Another title for this post could have been "Food we throw together and pretend to be real recipes". We threw this together because Nate donated blood and apparently they now can have you only donate just the red blood cells and, if they do this, they can take twice as much but that leaves you depleted of protein. 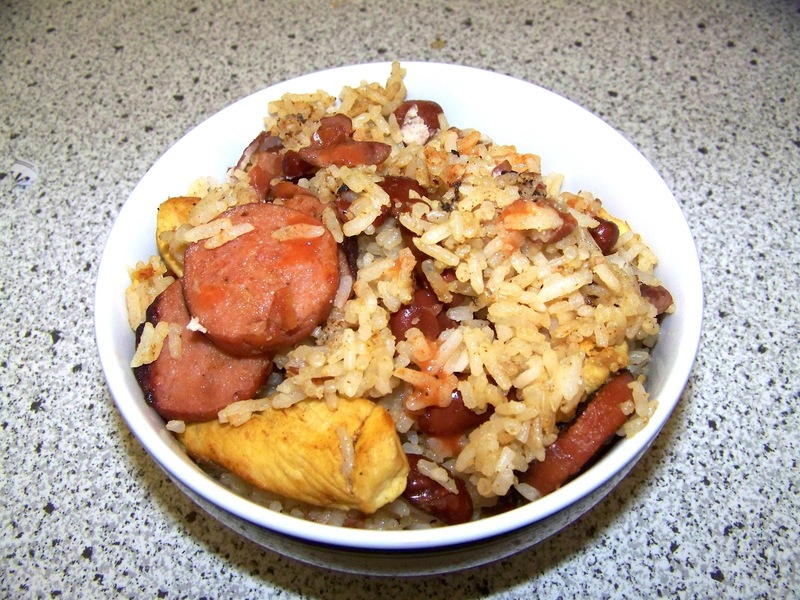 To replenish his protein we made this dish that has chicken, turkey kielbasa and red beans. We also paired it with some kale chips to really give him a boost in protein. Heat the oil over medium-high heat in a large saute pan. Add the chicken, 1 tsp of the garlic salt, turmeric, chili powder, cumin and paprika. Cook the chicken, stirring occasionally until almost cooked through. Add the kielbasa and beans and the rest of the garlic salt and black pepper. Continue to cook until the chicken is thoroughly cooked. Remove from heat and stir in the cooked rice until everything is well mixed. Serve and Enjoy! Notes: I'm not usually a huge fan of beans but they weren't overwhelming in this dish. I also haven't cooked with turmeric much and I really like the flavor it gave the chicken so I think it's something I'm going to start using more!